...the Netherlands home shirt that made as big an impact as the team wearing it during the Euro 88 tournament in West Germany. Worn by the Dutch in only their five games of that campaign, this was proof positive that adidas were truly breaking new ground back in the 1980's... but what specifically catches the eye of the 50GFSE panel? 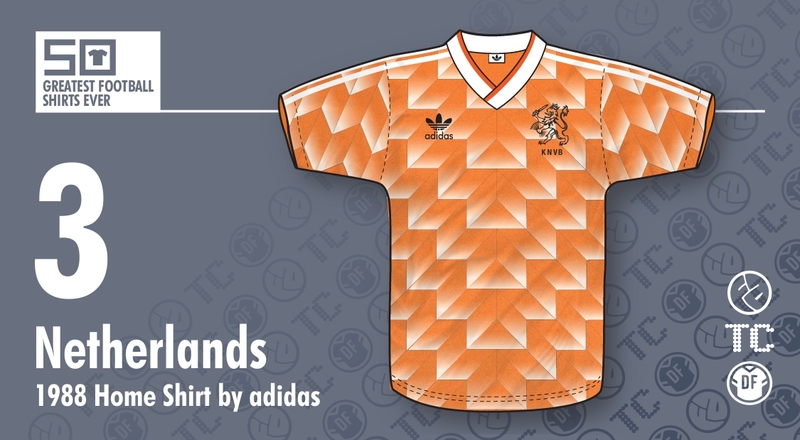 [Jay:] Whilst this geometric pattern was seen elsewhere in the adidas stable - notably carried by the USSR and West Germany - for whatever reason it is the Netherlands version which is both most recognisable and satisfying. This may be in part due to the Dutch success associated with the shirt, but the colour combination (orange, white and black) also seems to create a perfect balance. 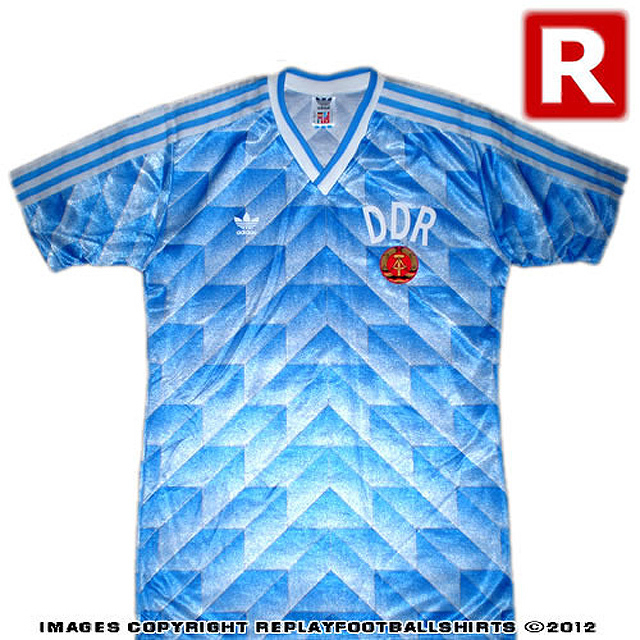 Whilst complex sublimation had been seen before - see Denmark in 1986 - this really was a proto-1990's release. In fact, the precise, symmetrical employment of the pattern, rather than gratuitous plastering, even suggests thoughtful restraint the like of which became en vogue decades later. The tastefully trimmed overlapping V-neck contrast collar, and the adidas logo and iconic KNVB crest in black (surely for reasons of clarity) facilitated the background pattern's purpose as a focal point whilst ensuring it wasn't an overbearing attention drain. The Dutch looked remarkable on their way to glory, but they still looked, first and foremost, Dutch. [John:] If ever a kit defined a tournament it was this one as the sublime Dutch side clinched the 1988 European Championship with style and grace – qualities perfectly reflected in this beautiful jersey. A forerunner of the crazy times to come and a real trendsetter, the heavily decorated fabric was hard to take in at first, so outrageous did it seem as it discarded the long-established solid colour approach to kits. But the blend of gradients and geometry created a classic. The template popped up in a few national kit bags at the time but no other side wore it quite as well as Holland. 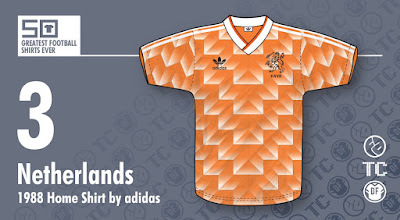 [Rich:] If you're ever wondering how a shirt becomes not only an icon, but also a design classic, look no further than the Netherlands shirt of 1988. While plenty of iconic shirts achieved their status due to the occasion they were seen in - several World Cup winning shirts are regarded as classics but in terms of design, are nothing special - Holland 88 staked its claim very loudly and from the instant it seared into our retinas. Worn for only one tournament, albeit for every single one of their matches (USSR, who had the same design, but in red, wore their white away kit in both the group stage meeting and in the Final), it arrived out of nowhere, smacked us all upside the head and left us all reeling. Sure, as Jay mentioned, plenty of other teams wore the same template (there are so many different colour versions of this shirt), and some are just as fondly remembered - West Germany's away is also regarded as a stunner - but it's the Dutch one that retains the fame....or infamy. Why? Maybe because it was worn in all matches and so was consistently available in high profile outings; maybe because they won in it then never wore it again, creating a punch-to-the-face impact that was never allowed to fade; maybe because it adorned the backs of Van Basten, Gullit et al? Or maybe just because it was orange? Take a crazy design and apply it to a standard footballing colour and it lessens the impact. Render it in something a bit more out there and you have something that goes nuclear on your senses. Imagine a pink version this? Or maybe lime green? Instant notoriety! And so it follows that, despite being nothing more than a vastly overused adidas template, the Netherlands shirts of 1988 rightly sits amongst the very best shirts ever! [Chris:] As John mentioned earlier, any move away from a strong solid colour for any team is likely to be controversial, but this one was so imaginative as to be breathtaking. Like a window shattered into a hundred or more pieces, each one retained its gradient-filled lightness in a way that had never been seen before. For me, the sight of this shirt during Euro 88 was one of those 'I was there' moments when you realise you're witnessing something ground-breaking. At a stroke, it rendered almost every other kit old-fashioned, so revolutionary was its design. Yet for all its geometric interest and delicately coloured beauty, one very minor detail helps to make it a classic - namely the thin grey outline that each of those angular segments possesses. It may not seem like much, but it helps to define the make-up of why this shirt is so special. Without it, the whole thing looks like a wishy-washy load of faded bits. Brilliant execution and brilliantly conceived.